Stay-Dry Doublers add absorbency and keep baby feeling dry. Made in USA. This is the same as our Hemp Doubler, (three layers of 55% hemp, 45% organically grown cotton) but topped with a layer of virgin Malden Mills 200 weight polar fleece. Polar fleece allows the moisture to go through but maintains a drier feeling next to baby’s bottom, since fleece is hydrophobic (afraid of water). 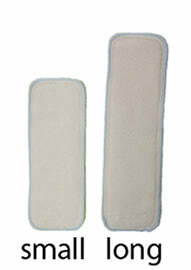 With quality polar fleece the argument that only disposables keep baby’s bottom feeling dry is simply not true. This washable synthetic really does keep baby’s bottom dry. More information and photos here. For all of these sizes of stay-dry doublers, the BLUE edge stitch side is the side that has the stay dry fabric. The blue edge stitch side goes next to baby. Think "b" is for blue is for baby. Solved our over night leaking problem! Got this for our baby girl when she was just a little over 3 months. She had been doing fine sleeping through the night, but when I'd get up with her in the morning she would be soaking wet. I needed something to help keep her staying dry and feeling dry too, and this was the perfect solution! I don't know what I expected, but it exceeded my expectations because the morning after the first night of using this I changed her and the side that you put up against your baby was completely dry! I couldn't believe it! I'll recommend this product to anyone! I can feel the difference on my baby’s skin! 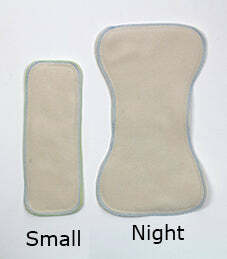 I believe she is more comfortable overnight because of these stay dry inserts. 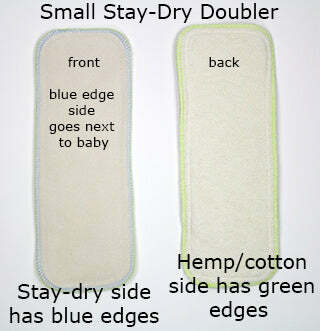 When my 15 month old started to wet through his pocket diaper (with microfiber and hemp inserts), I started to research overnight options for older babies. Our new “rig” is an XL cloth-eez prefold with an overnight stay-dry doubler, and a disana wool cover. Most nights, this can hold up for an incredible 13 hour stretch. When we switched, he started to sleep for longer, uninterrupted stretches. It’s a bit bulky, but seems to be comfortable enough for my belly sleeper. They work wonderfully!! Keeps my heavy wetter from getting diaper rash.